Australia's White-bellied Sea-Eagle is the second largest bird of prey on the continent. They have a wing span of 1.8-2.2 meters (6-7 feet), measure up to 75-85cm (30-33 inches) in length and can weigh up to 4.2kg (9 pounds). The female is also larger and heavier than the male. These beautiful birds are long lived and can live up to 30 years. They are found along the coasts and inland rivers of Australia, Tasmania, New Guinea, Southeast Asia and the coast of India. However little has been known in the past about their complete breeding cycle, from nest building to fledging. In 2009, the Sea-Eagle CAM was set up to monitor the White-bellied Sea-Eagle's nest which is located 15 meters (50 feet) above the ground in a eucalyptus tree. The tree is found in a protected nature reserve of Sydney Olympic Park in Australia. The webcam was set up by volunteers from the Birds Australia Discovery Center and Sydney Olympic Park Rangers. The webcam provides a wonderful opportunity to closely monitor the daytime breeding habits of the eagles and also the daily lives of the baby eaglets from the time they are hatched in early August to when they are ready to fly away in early November. This year 2 babies were hatched in mid August but sadly one of the babies died shortly after it was hatched. But the 2nd eaglet is thriving and doing well and can be seen every day in the nest. 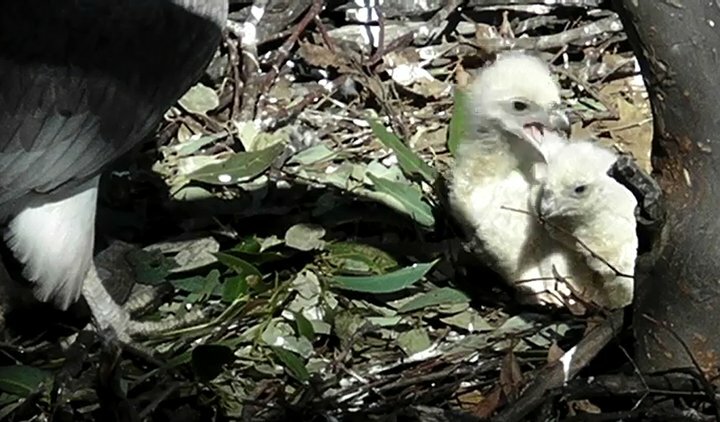 Enjoy watching this growing baby eagle and be sure to check back often. Responses to "Sea-Eagle webcam monitors baby eagle in Australia"
Wow, this is amazing. I didn't now there were white-bellied-sea-eagles and to be able to watch a baby in its nest live. Thank you from me and my grandsons.